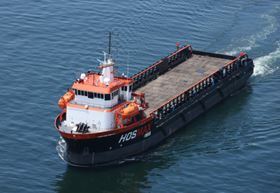 A Hornbeck Offshore supply vessel. The 2000 Series pumps will be fitted to 10 new HOS MAX 320 supply vessels which Mississippi-based VT Halter Marine is building for Hornbeck Offshore. The pumps will transfer up to 24 pounds of liquid mud to and from the vessels, which will be off-loaded when they reach the drilling rigs. The pumps will transfer mud at volumes up to 1000 GPM, handling pressures of 200 psi. The order was secured through Moyno’s partner company Chemetec Engineered Equipment.